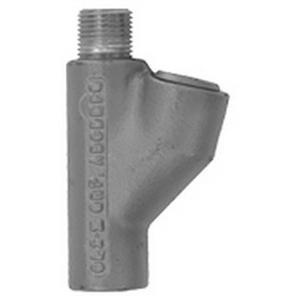 Appleton OZ Gedney Vertical/horizontal position conduit sealing fitting of trade size 1/2-Inch, is suitable for rigid/IMC conduits. Fitting features malleable iron construction and zinc electro-plated finish. Fitting with female threaded connection, has turning radius of 1-1/8-inches. It measures 3-1/4-Inch x 1-3/16-Inch Dia. Fitting is UL listed and CSA certified.